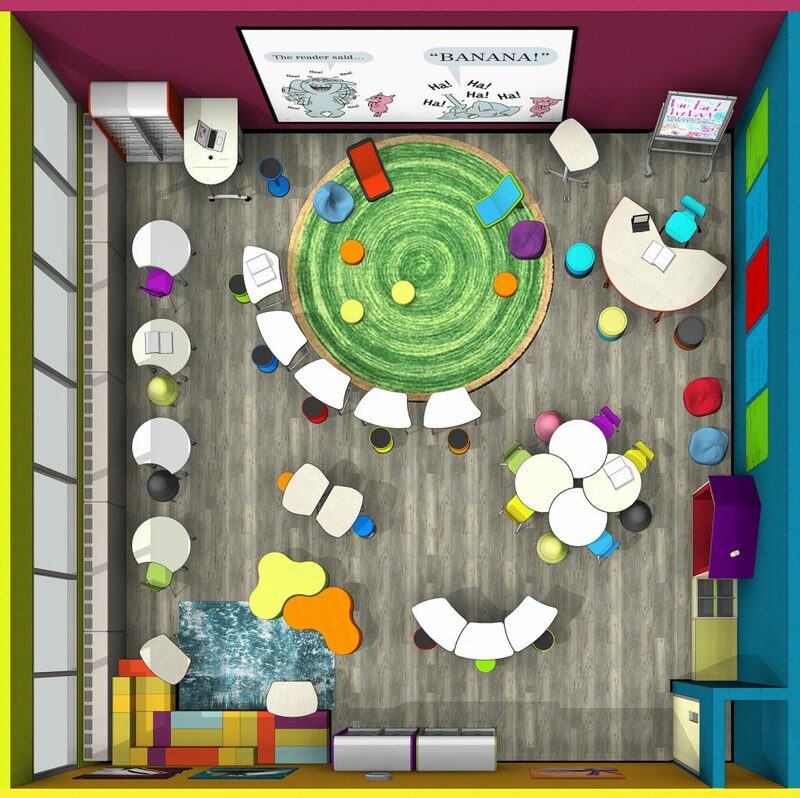 Are you looking for ways to redesign your learning space to better support learners? This may mean making it easier to spontaneously collaborate, integrating technology, or introducing flexible seating arrangements. Whether small or large, changes to your learning space will require planning, time, energy, and funding. With all these factors at play, you’ll want to make sure you’re making changes that will benefit your students in the long term. The goal in most modern learning spaces is to make as many pieces of furniture mobile as possible. This creates flexibility and allows educators to swiftly transition from individual to small-group to large-group work, all within the same space. Although it may be tempting to utilize your old furnishings and retrofit them with casters, this can pose a major safety hazard. 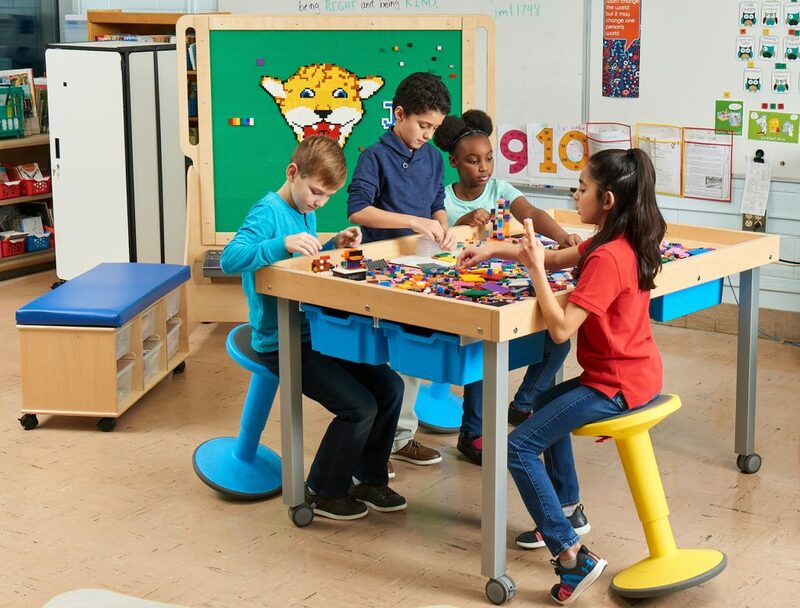 Educational furniture goes through safety testing and is specially designed and engineered to support the weight it will need to hold during its intended use. Retrofitting your current furniture or shelving with casters can lead to dangerous situations and even a potential lawsuit if someone gets hurt. To avoid any future issues, look for mobile furnishings that are designed especially for learning environments, many of which include casters and additional features such as the ability to fold and nest so you can move them out of the way when you need the space for different activities. Lack of power outlets is another reason you might want to retrofit your furnishings. With the movement toward 1:1 devices and multimedia group work, power access is critical. Although securing extension cords to your work surfaces can provide the much-needed power source, it’s not the best, or safest, option. Power cords pose trip hazards when left in the open, and they pose fire hazards when placed under furniture and rugs. Extension cords should only be used as a short-term solution. 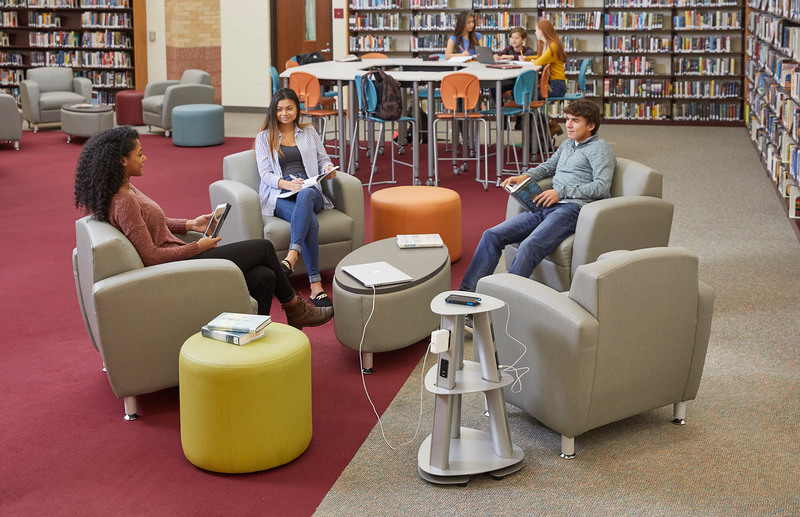 Many modern educational furnishings have been designed with additional power needs in mind. From tables that feature built-in outlets and USB ports to fully wired multimedia tables, there are options for any space. There are also economical ways to bring power to your existing furniture as well, such as mobile charging stations or units. 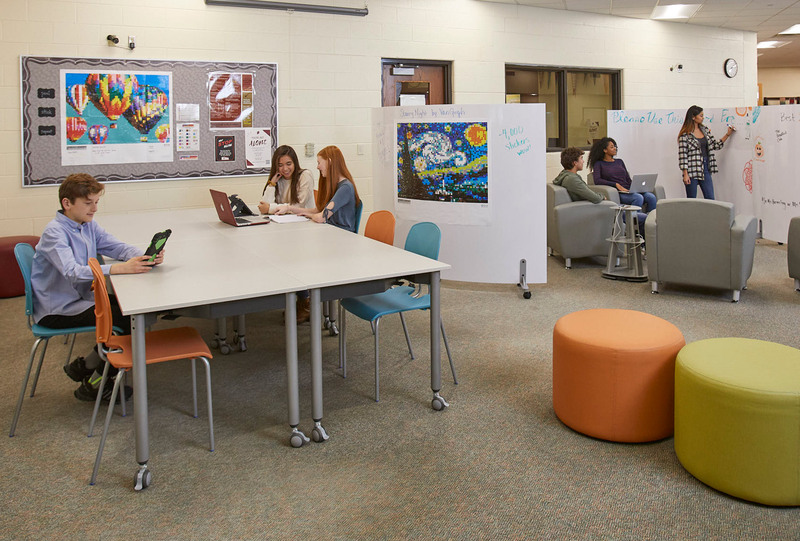 Redesigning your learning space can be a big investment when it means purchasing new furniture. You may be tempted to give new life to furnishings you find at garage sales or secondhand stores, or you might be the recipient of donated furniture from a well-meaning parent. Another possibility is purchasing alternative seating at discount stores. Although these scenarios provide economical options for making your learning space more comfortable and inviting, they come with their own hazards. The frames have not been designed or rated for stability, and can pose pinching, toppling, or breaking hazards. The fabrics have not been designed or rated for durability and can wear quickly. The fabrics do not carry fire-resistant ratings that are required for most learning environments. The fabrics do not carry commercial-grade moisture barriers and cannot be disinfected if accidents occur. Secondhand furniture can expose students to contaminants, including pet, rodent, or insect allergens. You can never be sure of the history of a secondhand piece of furniture and cannot ensure your students’ safety when using it. 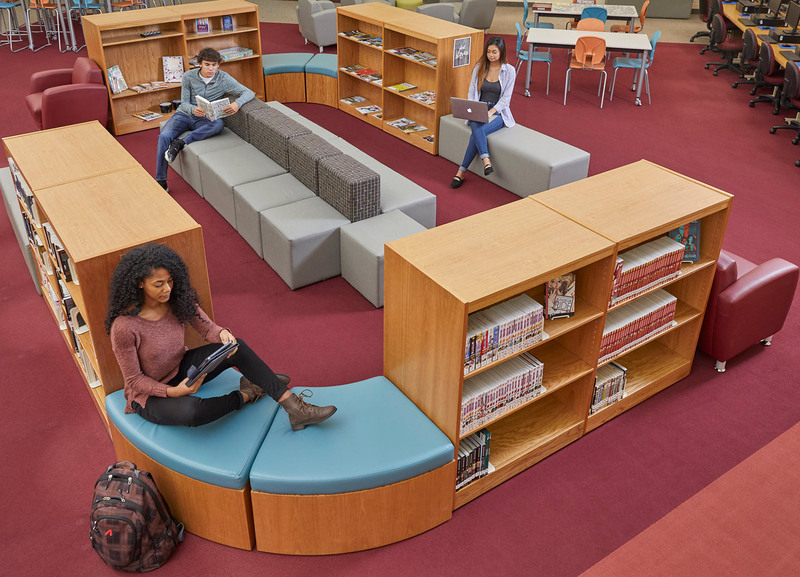 Non-commercial-grade furniture poses liability issues for the person who purchased it, as well as the library or school system. Although commercial-grade furniture costs more to invest in, the value of the safety and security you receive outweighs the cost. Educational furniture also provides you the security of a manufacturer’s warranty. Commercial-grade furniture doesn’t have to be cost prohibitive. Start by thinking about how you can achieve your dream learning environment in stages, acquiring one or two pieces at a time. Along with seeking out grants, reach out to your PTA to help with fundraising. Be sure to support your request with evidence and clearly spell out the learning outcomes you expect from redesigning your environment. When planning a redesign, it’s easy to get caught up in Pinterest-worthy images of the perfect space. However, you’ll get the best learning outcomes when you involve your learners in the process. After all, wouldn’t you be more inclined to do your best work in a space you helped design? Along with observing students, talk to them about what they’d like to see in their library or classroom and how they like to learn. Would they like a comfortable spot on the floor to do their work? Do they want a messy space to explore and create? Would they like to stand to work on projects? Introducing flexible seating arrangements and student choice in your classroom can have positive effects on not only behavior, but also on academic achievement. Learn more about why educators love flexible seating. Introducing active seating options into the mix so that students get even more movement throughout the day can also have positive benefits. Do you have learners who have trouble focusing? 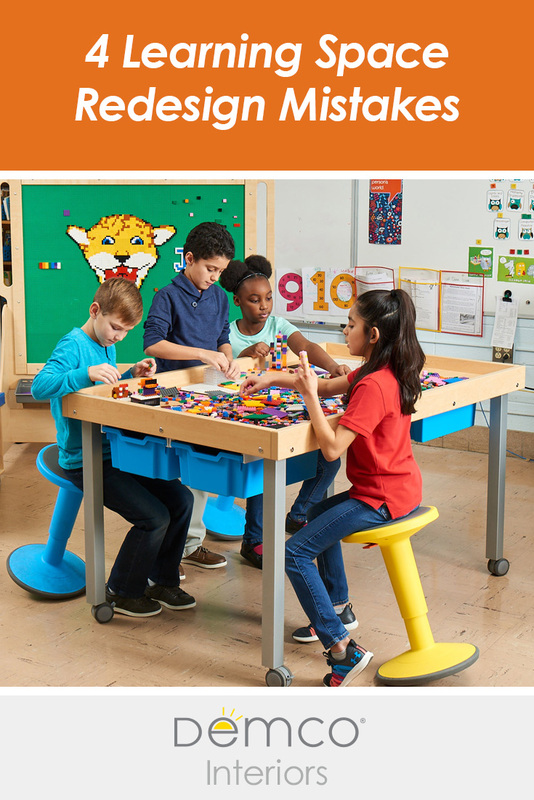 Learn how active seating can help fidgeters focus and even increase academic scores. Changes to the structure of your classroom are bound to affect the way you manage it, but you can use your traditional classroom management techniques to help everyone adjust. Like any new concept or activity, it’s important to set some ground rules for students and make sure they understand what is expected from them. Modeling proper behavior and reinforcing it with practice will also help your students adjust to their new environment and help you maximize their learning potential.